Left to right: Candidates Marcus Goodwin, Jeremiah Lowery, and Aaron Holmes; moderator Dyana Forester. Image by DC Working Families used with permission. What should the District do about longtime residents who can no longer afford to stay in their neighborhoods? Or people who don't have a home at all? 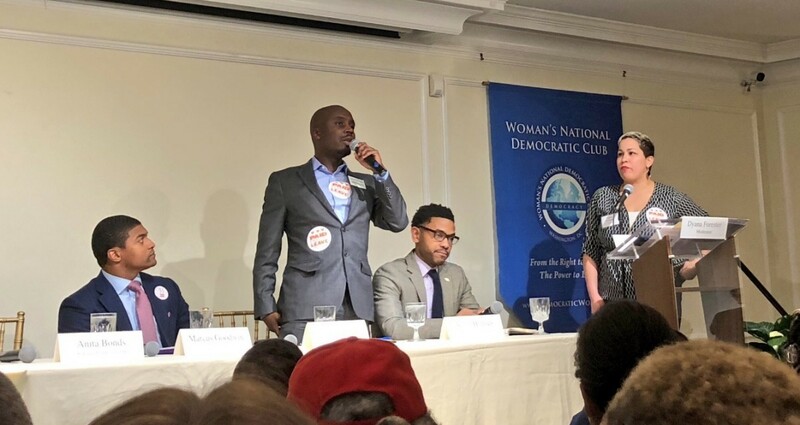 While the first at-large debate took place at the Woman's National Democratic Club in Dupont Circle on February 6, its discussion focused most on the needs of the District's poorest residents, most of whom live far from this northwest DC spot. It also showcased the differences between candidates with deep experience and those without. The forum contained two panels back to back. The first introduced candidates for the Democratic nomination for DC Council at-large: Aaron Holmes, Jeremiah Lowery, and Marcus Goodwin. Incumbent councilmember Anita Bonds did not attend the forum. According to organizers, she had agreed to attend but then did not show, which is disappointing. 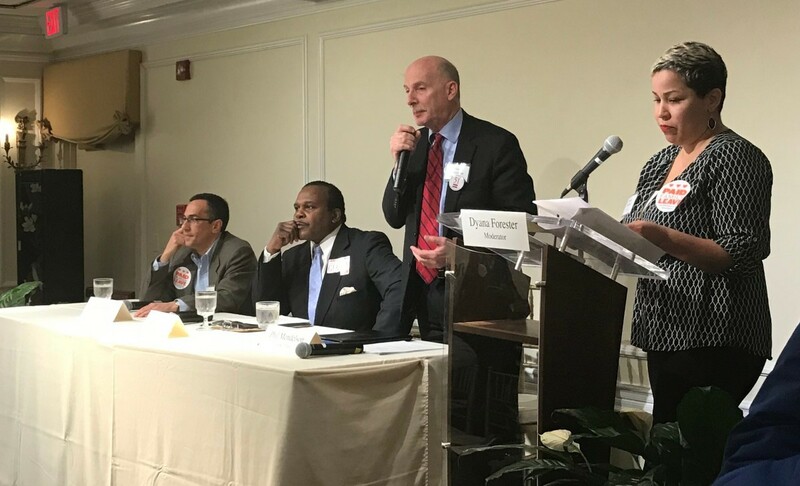 Second was a battle of the wonks, with two men who may know more about the District's budget and programs than almost anyone else: Current Council Chairman Phil Mendelson and recent DC Fiscal Policy Institute head Ed Lazere. Perennial candidate Calvin Gurley also crashed the debate. A contrast of experience levels was clearly on display between the two panels. Mendelson and Lazere traded detailed critiques of each other's policy approaches backed up by statistics, past record, and comprehensive policy proposals. Meanwhile, the three young men vying to unseat Bonds were bursting with passion and energy on important issues — especially equity — but also made some mistakes not uncommon to first-time or second-time (in Holmes' case) candidates. Left to right: Candidates Ed Lazere, Calvin Gurley, and Phil Mendelson; moderator Forester. Image by DC Working Families used with permission. He had reams of compelling facts about the District's racial and economic divide at his fingertips. The median black household has an income of $40,000 and a net worth of $3,500, he said. The median white household: $120,000 of income and $280,000 in net worth. That really helps when it comes to buying a house, for instance. His solutions involve more funding for affordable housing, and he recently endorsed using some of the District's budget surplus for that purpose. Lazere also talked about policies around child care, aftercare, and summer school, and about the need to rebuild Metro — the only time in the whole two-hour pair of panels where transportation came up. Mendelson asked the audience to vote for him based on his long record at the council. He said that on affordability, “candidates stand before audiences and make it sound like it's easy,” but if it were, it would have been solved. He also argued that the problem extends beyond the mayor and DC Council to the federal government. Mendelson cited his work on an income tax cut package, which he said led to the bottom 20 percent of residents paying less in taxes than the top 1 percent, as a main achievement. (Lazere co-chaired the tax commission which came up with the cut proposals.) Mendelson also cited reducing real property taxes as a way to combat inequality as well as measures to increase jobs. He said he's supported adding money to programs like the Local Rent Supplement beyond what the mayor proposed. Lazere's and some questioners' most significant criticism of Mendelson was his support for reopening the District's paid family leave law, which passed last year. Lazere called it a “model law” that he would implement as is. While Mendelson supported it in the council, in the face of business opposition has also supported studying making changes (or as supporters of the law call it, “repeal and replace”). The main potential change would switch from having a District agency collect taxes from employers and pay benefits to employees directly, to a mandate where employers would have to offer their employees leave. Mendelson argued that the only way to get it through the council in the first place was to agree to study this option later, and that's what he's doing. All three candidates support a potential bill to limit Airbnb and another to protect affordable housing. Mendelson urged voters not to make the race about who's more progressive but to look at his very progressive record, including his advocacy for a marriage equality bill in 2010 and the way he's made the council much more respected than under some recent chairmen. Image by Keith Ivey used with permission. “We know what happens if we continue down the path we are on,” said Aaron Holmes in the at-large panel. “DC is more valuable if we hang on to our legacy residents.” Lowery worked to claim the mantle of “most progressive” candidate, emphasizing his support for many progressive causes like paid leave and early child care. Marcus Goodwin, who's worked in real estate development, said he knows how deals work and can help make things happen, like bringing more grocery stores to underserved areas. Most importantly, he said, he'll know when someone is asking for more of a subsidy than they really need. He argued that on the council, he could better push back against unnecessary giveaways. Lowery spoke strongly for revising the affordability thresholds to use the District's median income, rather than the regional median, as a standard for affordability. He also repeatedly endorsed stronger and more universal rent control. When asked how to attract more grocery stores, Holmes correctly pointed out that grocers come to a neighborhood if there is enough purchasing power, which can either happen by adding new people or increasing incomes of the ones already there. The latter, he said, is something “we have failed to do across the country” and he'd like to see DC do more to invest in its residents. One question asked for a simple yes or no about a proposal to exclude tenants in single-family homes from the Tenant Opportunity to Purchase Act (TOPA). TOPA lets tenants buy buildings and remain in their housing, but also has been abused and can significantly delay a homeowner from selling their own house. Lowery and Goodwin oppose the change, while Holmes supports it. Especially as contrasted with Mendelson and Lazere, the candidates' passion sometimes outstripped the sophistication of their specific ideas. While a semantic point for sure, it's the kind of mistake that highlighted the candidates' inexperience. That certainly doesn't disqualify them, and they frequently contrasted themselves to the incumbent who may be experienced but also hasn't been a very active councilmember. “She hasn't shown up as homelessness increased 132 percent,” said Lowery, making reference to Bonds' absence at the forum. “She has not shown up when it comes to addressing paid family leave,” he said, criticizing her willingness to change the law. 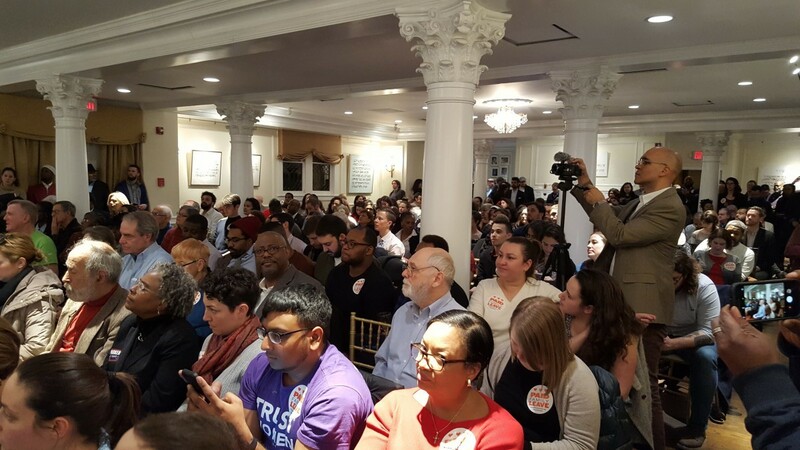 The crowd, reflecting the primarily social justice, labor, environmental, and progressive organizations sponsoring the forum, was not quiet about its views (and ignored pleas from moderator Dyana Forester of UFCW Local 400 to hold applause). Experienced candidates (not named Trump) for high-level federal offices generally recognize the need to not get swept up in the crowd and think about how words will play on TV. This event was livestreamed on Facebook. Who's to blame for housing unaffordability: Developers or politicians? At times, Lowery also struggled to articulate his views about affordable housing in a constructive way. He often said he would “hold developers accountable,” including as part of an answer to a question that was about education. Phrasing it as such, without policy ideas to back it up, can be a cop-out. It embraces a frame that developers are the sole people to blame for DC's problems — a common but problematic trope that actually diverts attention from complex issues and solutions. Developers operate in an environment of rules and incentives that elected leaders set up and enforce. If Lowery means cracking down on developers who break the law (and some do), then that's great and important. However, we also need more homes and more affordable ones, and we're going to need (law-abiding) developers to build them. To do that, our zoning and land use policies must prioritize building and preserving affordable housing, and provide mechanisms for developers to do so within the realities of the real estate market. Goodwin, on the other hand, talked about maximizing community benefits through development. Holmes said that “development masks hardship,” pointing out how growth leads to statistics about overall District prosperity that hide the difficulties others are facing. These were all views of the issue fairly grounded in economics. I'll be looking forward to seeing how these promising and energetic candidates further develop their policy views and their political styles as the campaign progresses over the next few months. You can watch the forum here. Keep up with our ongoing coverage of the 2018 primaries in DC, Maryland, and Virginia through our weekly newsletter. Correction: The initial version of this post misstated the average black household net worth as $35,000. It is actually $3,500. Also, the initial version said that only Holmes and Goodwin referred to the legislature as “city council”; in fact, Lowery did as well. The post has been updated.